When it's time to get work done, then gear up at Big Pines Hardware. As your source for construction hardware, power tools, and hand tools in Silver Springs, Florida, we empower you to do more, save money, and get results. Featuring some of the top brands and names in the construction and hardware industries, you'll find long-lasting tools at affordable prices. You know your project goals — now realize them. We are happy to help you. Our experienced sales staff is well-versed in all the tools and gadget we offer. If you're stuck on a specific task, let us know, and we'll point you to the right tools for the job. Our top priority is to provide you with personal and professional service. We're here to help you choose the best tool for your needs. Proud Supporters of "Made in America"
This brand new line of tools is competitively priced and is of the top-quality, there is a 2-year warranty on all of the tools, and a 1-year warranty on the batteries, and all-oscillating accessories fit all other brands of power tools. Come in and check out the new end cap. 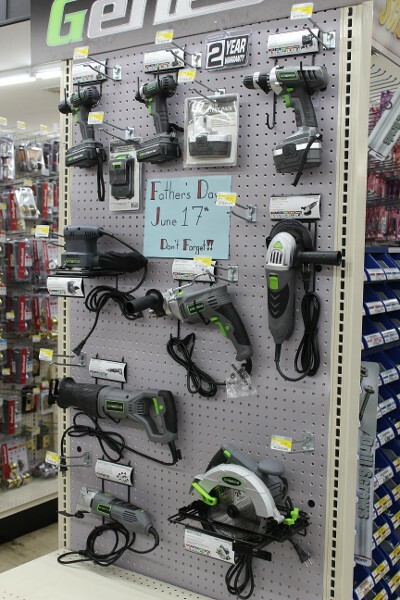 Maybe you will find Father's Day present while shopping!